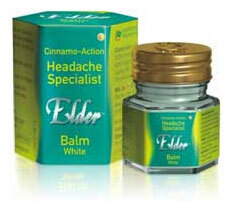 Buy Elder Balm White and Strong Online - Instant Comfort Relief from Headaches, Pain caused due to stress, cough & cold. Instant Relief from headaches caused due to stress, cough & cold. Headache specialist – Cinnamon (Dalchini) Oil mixed with special herbal ingredients provides you instant comfort from headaches caused due to stress, cough & cold. 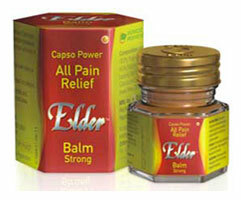 Elder Balm White,the balm that cures all kinds of aches and pains in no time. Its cinnamo action quickly works on the affected area giving instant relief from pain. Presenting Elder Balm Red,the balm that calms any headache instantly. Its unique Capso power provides long lasting relief from headaches caused due to stress, cough and cold. Capsicum Oleoresin mixed with special herbal ingredients provides instant relief from all kinds of pain.